Our big three day workshop is just a day away. We still have a couple of openings on Friday and a few for Saturday. So if you are interested in learning about the longarm, please call now to reserve your spot. Our classroom is full of Handi-Quilter Longarm quilt machines and each person will have a chance to try the machines. If you are registered for any of the classes, they will begin at 9a.m. so please plan to be here by 8:30/8:45 a.m.
Cathy will be teaching a 6 month Block of the Month called Rachel Remembered 1820-1850. This is Betsy Chutchian’s for Moda. Betsy is know for her classic reproduction prints inspired by moving historical stories. Come in and see this as it is beautiful. More details will be available soon. If you are interested in this but unable to attend, we can ship (for a fee) each set of blocks. Please watch the newsletter for more information. May 10, 2017---- Embroidery Class morning class beginning at 9 a.m. and afternoon class beginning at 1 p.m.
Our May project is a cupcake greeting card. Items needed for class: 5x7 hoop, self-adhesive Stablizer, thread in colors of yellow (we used a light lemon), blue, salmon, white or green depending on what you want. You are welcome to stop by the shop to see the fabric. 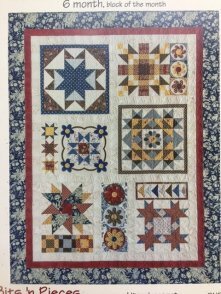 May 13th ----Sharynn’s Quilting Friends meeting at 9a.m. here in our classroom. Beth will be showing HEXIE Placemats using Creative Grids 60 degree Triangle Ruler. If you aren’t a member and want to be just come in and join!! We have lots of fun and great show ‘n’ tell. All black and white fabric will be on 20% off from May 4th to May 10th. We also have some quilt kits that are on 50% off sale. Come and see what we have.